Since my blogging career, I see most of the blog content writers used to publish articles on their blogs just to increase the number of posts. Actually, this is not a fair idea to become a professional blogger. As if you go through SEO keywords ranking factor for today in 2017, you might know the importance of writing quality content. So, it is essential for every content writer on blogs to understand the top content writing tips in order to keep your audiences stay focused until the end of the post. Maintaining both bounce rate and average duration per session are major considered factors of search engine optimization. This is the one content writing tip I am following nowadays and worked out the lot for me to have the readers stay more time on my blog. When you start writing the content, ensure let your readers know through the post, why you choose the particular topic, what research you made before writing the post, is there any specific reason to publish the article and more. I believe adding this kind of extra kinds of stuff would definitely make your readers mind decides to continue with the post till the end. Your audiences may feel interesting to read behind the scenes about your particular blog post than just read only about the topic. If you are about to write a sentence in your content, ensure the sentence has not more than 20 words. Probably a sentence with more than 20 words might not reader-friendly to understand the meaning of the sentence. So, learn to separate your long sentence into two parts. At the same time, never miss out the meaning what the sentence exactly needs. In the scenario like, there is no way to separate the sentence then you may go more than 20 words. Because you can use more than 20 words sentence on your content up to 25% according to SEO factors. 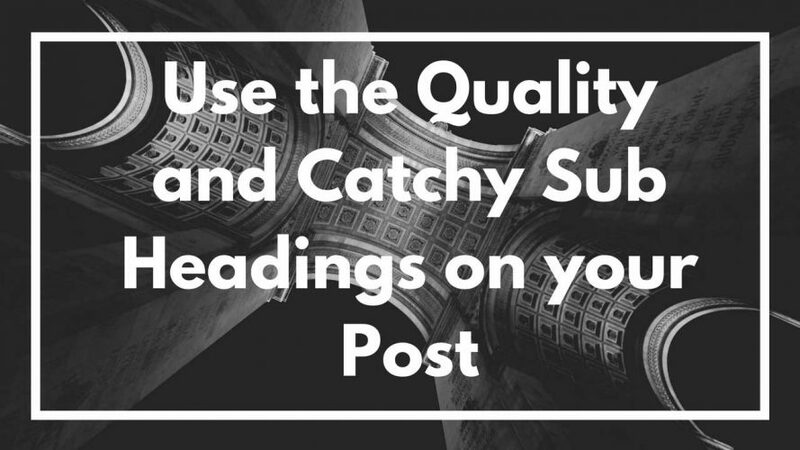 Separate your content paragraphs with subheading are a better way to mention your thoughts in a clear manner. If possible add the relevant keywords in the subheadings for search engines better rankings. Adding targeted keywords in subheadings would help make your targeted keywords come under H1, H2, H3, H4 tags. The most important thing you should aware that you have to intense on adds the content much relevant to the subheadings. No point of irrelevancy portions which are not related to the title of the headings. Follow the habit of writing catchy subheadings would guide readers to read the content with more curiosity. Don’t just look for publishing your content to your blog right after finishing it. Make sure to read your finished content, again and again, help you make necessary changes as possibly you itself may be missed out something important in your very first attempt. Think yourself as a reviewer or an audience and feel free to read your just finished content in order to find out to make corrections if any. 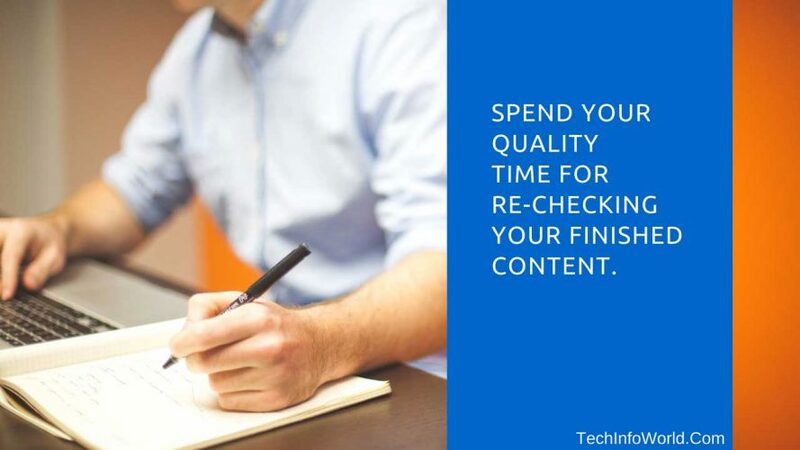 Time is money, so don’t think like you are wasting time on your content even after finishing it to read it again. I am damn sure if you follow the tip, you can produce content for your blog that your readers love to read and they will be excited to check out your next post update. 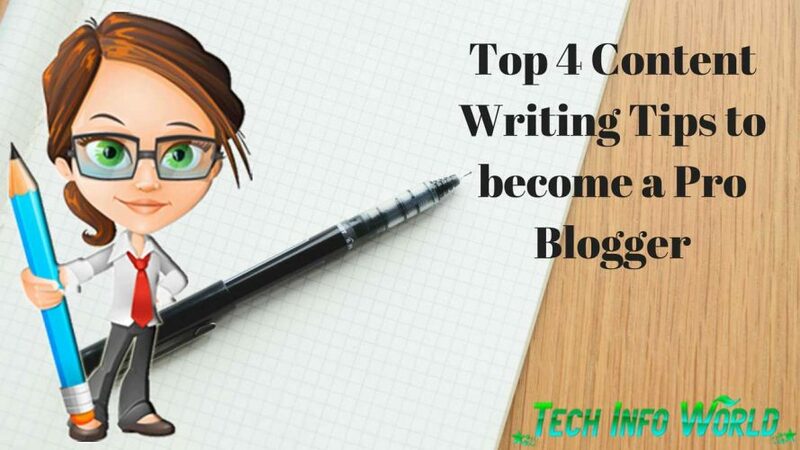 Following all the four best content writing tips would definitely much-desired tips to deliver a promising blog post to your readers. Share the content to your social media handles if you absolutely think the post is worth reading. Meet you guys again on another interesting topic. It’s been 1 year now that I started blogging I still have a long way to go. It’s always refreshing reading these types of articles it motivates me to keep going and give tips at the same time. Great article, the most important skill that you need to develop for writing a good content is developing focused thought. Stray ideas are very hard to frame until they are collected point by point. Writing is more an aggregation of thoughts and less and art now.You must be clear what are you writing about. Thanks for the post it really defines the skill of writing in a nice way.